Nissan will build the Leaf, pictured, alongside the Juke crossver in the UK. TOKYO – Nissan Motor Co. said it will build the new Leaf electric vehicle at Britain's Sunderland assembly plant starting in early 2013, with initial capacity of 50,000 units. The Japanese company and its French alliance partner Renault will invest more than 420 million pounds ($642.6 million) in the project, including the construction of a lithium ion battery plant on the site. Sunderland will be the third global production site for the five-seat Leaf hatchback, which is the centerpiece of Nissan's plans to take the lead in zero emissions vehicles. Production begins in Oppama, Japan, later this year followed by Smyrna, Tennessee, in the United States, in 2012. Sunderland will come on line in early 2013 with an initial annual production capacity of about 50,000 units, Nissan said. Initial sales of the Leaf begin this year in Japan, the United States and selected European markets. Nissan aims for global mass marketing from 2012. So far, Nissan and Renault have announced global electric vehicle production capacity of 500,000 units. Renault begins rolling out its electric cars next year. 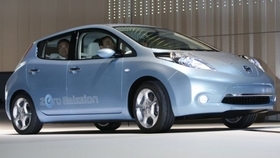 Nissan will start preparing Sunderland's Number 2 line in 2012 for the addition of the Leaf. It will be made alongside the Juke compact crossover, which enters production this August. Sunderland will also get a battery manufacturing plant with capacity of 60,000 units a year. It enters operation in 2012 and will supply both Nissan and Renault electric vehicles. Nissan said production of the Leaf and batteries would be supported by a British government grant of 20.7 million pounds and a proposed finance package of up to 220 million euros ($302 million) from the European Investment Bank. Nissan has not yet specified how much the Leaf will cost, saying only that it will be competitive with similar-sized cars with conventional engines, excluding the price of the batteries, which will likely be leased in most cases. The company is expected to announce a price range for the Leaf at the end of this month to start taking orders from customers. The Sunderland battery plant will supply lithium-ion batteries developed jointly by Nissan and Japan's NEC Corp. Nissan is also due to produce batteries in Portugal to supply the European market.